The check ride is the final step before becoming a certificated pilot, and it's a large, stressful step! With the never-ending list of details to study and maneuvers to practice, check ride preparation can seem impossible. If your instructor signs you off for a check ride, chances are good that you'll pass with flying colors, but mistakes happen, especially when we're nervous. Here's a list of common reasons students fail check rides. Don't make one of these common mistakes! 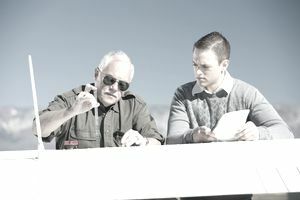 One of the most common check ride problems begins with the initial paperwork review. Before anything else, the designated examiner must first review your logbook and flight times to ensure that you've met the minimum requirements. Make sure you and your instructor go over the specific requirements for the certificate being sought. The private pilot certificate, for example, requires that applicants have at least 40 hours of total time, two of which must be instructional, three of which must be instrument instruction, three of which must be cross-country instruction, three of which must be night instruction, and so on, along with all of the proper endorsements. Your instructor should ensure that you've completed each of these requirements before you see the examiner, but it's not uncommon for something to be overlooked. A designated examiner won't get into an airplane that is not airworthy. Make sure your airplane is up to date with all of the required inspections. Many check rides have been called off and rescheduled because the aircraft is not deemed airworthy during the initial part of the check ride. Failing to use checklists, or using one only casually, tells an examiner that you'll forgo the rules for the sake of your own convenience. Even if you're able to safely conduct the flight without a checklist, the lack of checklist use might be enough for the examiner to feel unsafe and deem you an unsafe pilot. Use the checklists! They're there for a reason. Disregarding a Topic Listed as a "Special Emphasis Area"
The special emphasis areas are listed in the beginning of the practical test standards, and they include things like collision avoidance, positive exchange of flight controls, and wake turbulence avoidance, among other things. These areas are specifically set aside by the FAA as areas that pilots should focus on in order to improve the overall safety of general aviation, and if you don't play along, the FAA won't like it. Find and study these special emphasis areas before your check ride. Stalls, spins, and loss of control accidents are still the most common cause of general aviation accidents today. A stall is potentially the most important maneuver to avoid and/or recover from when it occurs, so if you struggle with them, get extra help before your check ride. An improper stall recovery procedure is grounds for failure on any check ride. Spins and spin recovery procedures are important. The examiner, at the very least, needs to know that you're aware of what a spin is and how to get out of it. If you aren't, you have no business flying around in small airplanes. Many accidents and incidents in general aviation still occur during the landing phase of flight, making the go-around a very important maneuver to master. Messing up the go-around (by bringing the flaps up before adding power, for instance) is a safety issue and a common reason for failing a check ride. We don't practice go-around procedures enough - we all want to land perfectly - so get out there and practice! To make sure you'll handle a real-life emergency well when you're faced with one, the examiner will want to see that you can accomplish an off-airport landing if necessary. Overshooting or undershooting the landing spot, not obtaining best glide speed, not turning directly toward your landing spot, or delaying the emergency landing checklists can all lead to a check ride failure.